The Twitter sensation speaks about creating his online alien persona as an extension of his own feelings of being an outsider. Jomny Sun is the alter ego of Jonny Sun. As Jomny, he tweets from the perspective of an alien trying to figure out how things work on Earth. His funny and often misspelled tweets have garnered him more than 500,000 followers. 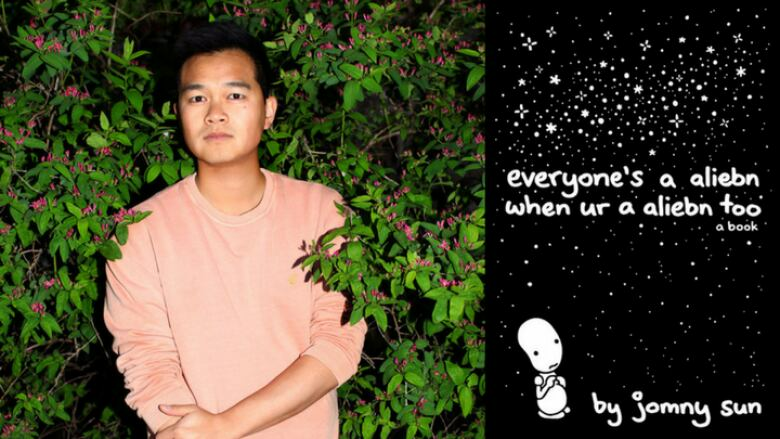 He collected his tweets and drawings into a book called Everyone's a Aliebn When Ur a Aliebn Too. This interview originally aired on Nov. 13, 2017. "I first started using Twitter to keep in touch with my friends after we graduated from high school. I had been posting updates like, 'Just had a sandwich. Just saw a cool movie.' It wasn't until I started to get into comedy writing that I started thinking about Twitter as a comedic platform. I thought it would be a good way to continue practicing and honing my joke-writing craft. The character limit forces you to be concise. I like how instant and connected to a community Twitter feels. You get to write these things and get an immediate response. You get to work on things on the fly and just put everything out there. I've always seen Twitter as this writer's notebook, where I get to test my material and make things shorter and punchier." "I think of Jomny Sun the alien in two ways. On Twitter, I do see it as an extension of my own identity. I see it essentially as myself. I just constructed this different identity that allows me to inhabit online spaces and to live online. Everything I think gets filtered through this voice. In the book, I see Jomny Sun as more of a traditional literary character. Jomny is an alien who is more of a listener than a talker, someone who is happy to assist others and to learn from others. "I wanted to write a story that had, at its core, a protagonist that was more of a background character and less of someone with a strong active voice that was driving forward some sort of story. That's basically how I see myself in the world. I see myself as an outsider, someone on the sidelines who is more comfortable with listening and asking questions than speaking and leading the way. I wanted to write a story that honours that and pays tribute to that." Jonny Sun's comments have been edited and condensed.